It’s that time of year. Time to recap the biggest trends at this year’s CES. It’s crucial we understand where technology trends are headed as experiential expectations are set in people’s everyday lives – and as those designing, building and managing experiences it is important we understand the technology expectations of our audiences – attendees, exhibitors and sponsors. The show was dominated by voice-activated ‘everything you can think of’. Google’s Personal Assistant, Amazon’s Alexa and the introduction of Samsung’s Bixby personal assistant and all the applications powered by them were everywhere. Today’s customers live in connected homes where appliances and electronics can talk to each other. But beyond smart home applications, more and more apps were introduced that could be voice activated/enabled, from starting your car to managing your calendar and much, much more. Note: the use of voice activation in the tradeshow environment remains a problem, as the ambient noise of the show floor continues to be a challenge for Alexa and her pals to properly hear and act upon requests. Artificial intelligence is the underlying technology that powered most every other innovation at CES. Representatives from some of the most innovative. AI can and will transform everything from how we get entertainment to how brands connect with customers, so a strong understanding of the latest developments is crucial for designing superior customer experiences. Perhaps nowhere else did CES look more like a science fiction film than in its AR and VR displays. Representatives from healthcare, sports, and entertainment showed off their newest developments. We’ve seen a huge boom in consumer AR and VR in recent years, and trends indicate it will continue to improve. The industry has made terrific advances in headwear with new AR glasses that allow for hands-free AR overlays on transparent lenses. One of the biggest trends at CES 2019 were new applications for the Internet of Things. 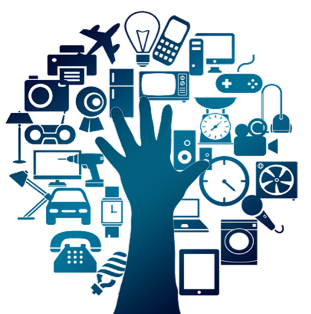 Consumers and brands already use the IoT every day with connected devices. The biggest advance seen in IoT at CES this year were enterprise solutions – from monitoring and managing energy use in workspaces to a multi-purpose headset that could be used as a barcode reader, videoconference viewer, media recorder or player or even a language translator. Connectivity is today’s currency, and 5G is the key to connectivity. A full 5G rollout is predicted for late 2019/early 2020. 5G affects everything from wearable devices to sensors and self-driving cars. For consumers, it means getting information faster and having nearly instantaneous access to data, activities and entertainment. This upgrade in the nation’s cellular/data infrastructure will mean even higher-performing digital applications. We really are moving quickly to an even more digitally-centric world and the new products and prototypes shared at CES showed just how much more embedded technology will be in our everyday lives and how we need to think about that when designing experiences for our attendees, exhibitors and sponsors.